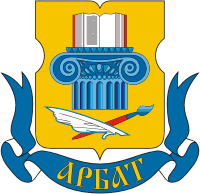 Arbat District (Russian: райо́н Арба́т) is a district of Central Administrative Okrug of the federal city of Moscow, Russia. Population: 28,179 (2010 Census); 25,699 (2002 Census). The district extends from central Mokhovaya Street west to Novoarbatsky Bridge over the Moskva River. Its irregular boundaries correspond roughly to Znamenka Street and Sivtsev Vrazhek Lane in the south and Povarskaya Street in the north. Main radial streets are Vozdvizhenka Street, New Arbat Street and pedestrian Arbat Street. Aeroflot has its head office in the district. ↑ "Queries." Aeroflot. Retrieved on June 29, 2010. "Legal / mailing address: # 10, Arbat street, 119002 Moscow" – "Обращение в авиакомпанию." – Address in Russian: "Юридический адрес / Адрес для почтовых отправлений: 119002 Москва, ул. Арбат, д. 10"